Posted under Parents' Articles. Updated 19 April 2017. 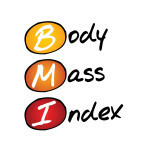 BMI, short for Body Mass Index, is a ratio of a person’s height and weight. It does not measure body fat, but can be an indicator of body fatness. Although having some body fat is healthy and normal, having too much or too little body fat isn’t. Having a high BMI has been linked to certain health problems such as high blood pressure and Type 2 diabetes. Similarly, having a low BMI is also unhealthy. You child’s weight (in pounds) times 703 divided by his height (in inches) squared. You can also use this link to determine a teen’s BMI. Once a teen’s BMI has been calculated, it can be interpreted using growth charts designed by the Center for Disease Control (CDC). These charts (one for boys and one for girls, aged 2-20) are used to convert a teen’s BMI into a percentile. This percentile tells us how a teen’s weight and height compares to other teens of the same age and gender. The best way to interpret a teen’s BMI is to track it over time on his growth chart. Teens should stay at about the same BMI percentile during their teen years. If a teen’s BMI percentile goes up or down quickly, he should talk with her health care provider to talk about the possible reasons for the change. Example: A 13 year old male has a BMI of 18.5. 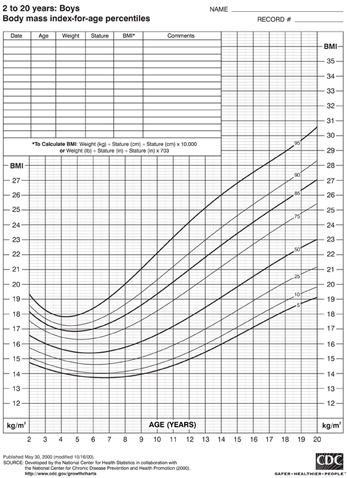 Using the boys’ 2-20 years BMI growth chart, his BMI plots on the 50th percentile, which classifies him as normal weight. BMI is used to identify teens who may be at higher risk for weight-related health problems. A teen who classifies as underweight, overweight, or obese should be seen by her health care provider for further evaluation. A health care provider can screen for health problems and then help develop a personalized weight management plan if it is needed. A referral to a dietitian may be suggested. Some schools in the United States are checking weights and heights of students at school, calculating BMI, and sending this information home to parents as a BMI report card. The controversial report cards are used to identify teens who are underweight, overweight, or obese. Teens who fall in any of these groups may be at a higher risk for weight-related health problems such as eating disorders, high blood pressure, high cholesterol, and Type 2 diabetes. BMI is just an estimate of body fat. Most teens that have a BMI in the overweight or obese category also have a high amount of body fat, but there are some that don’t. This may be true for very muscular teens since they may have a higher weight because of their muscle mass but still have a healthy amount of body fat. Additionally, BMI should be cautiously interpreted in teens that are growing or going through puberty. During these times, weight, height, and body fat change at different times and rates, which can affect BMI. If a teen classifies as underweight, overweight or obese, he needs to be examined by his health care provider who can evaluate potential health risks and offer personalized resources.